That is if you move at all. I normally do not advocate for any company or organization because I believe people are capable of making their own choices. But this time, I'd like to bring to everyone's attention this simple method of supporting good causes of your choice by just being alive. This can be done through Plus 3 Network. All you need to do is logging your daily activities there. The idea is, Plus 3 has secured a set of beneficiaries (causes) that people can choose to support as well as a corresponding set of sponsors (one-to-one relationship). Once you choose your cause to support, any activity you log (by hand typing or using your GPS) through their site will help raise money for that cause, which will be donated by the corresponding sponsor. To be honest, in the beginning, I was a bit thrown off by the fact that Plus 3 was not a non-profit organization, so when I had trouble uploading my GPS data first time I tried a year ago, I did not try again. But I've come to terms with that grudge since. After all, it's a great idea. We do these activities anyway, and this is a simple way to make them count. The people who came up with the idea and the platform deserve to be awarded. So, here I am, giving a shout out on their behalf. BTW, last night when I tried, uploading data from my GPS was extremely easy. Below is a list of the activities that can be logged as of today. Now, do you see what I mean by raising money by just being alive? Call me cynical, but the Plus 3 network strikes me as too much of a waste of time. I’m happy to just plain donate the small amount of money they raise instead of bothering with their silly web site. How do you know if they really make the donation? Do you ever get confirmation from the group you elect? I will not pretend that I do my sports such as road riding, mountain biking, and rock climbing, etc. because I want to help some charity. I sometimes push myself and suffer pain while doing these activities, but that's only because I get some satisfaction out of it eventually. (Alison, I'm sure you understand this all too well). So, you will never find me soliciting to friends and family "fund my miles, or climbs, and I'll kill myself to go further because I have a higher purpose that goes beyond my own desires." Yeah, call me cynical. However, looking at the Rates table on their FAQ page, I realize that pretty much any exercise I do can help raise some money. Since I'm doing these things anyway (for my own satisfaction) on a fairly regular basis, why don't I make them count for something else as an extra, especially when that "something else" can help someone else. I know I will not be logging every thing I do. 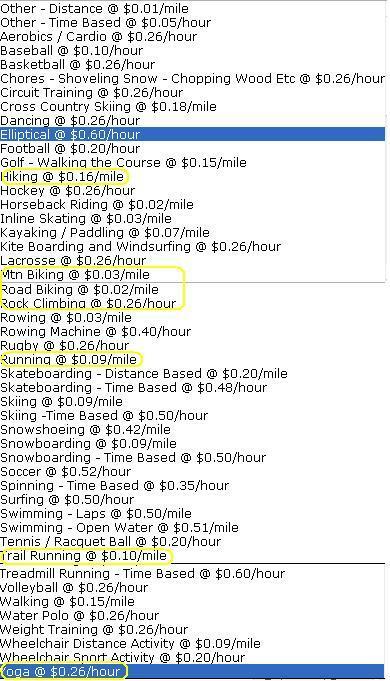 For example, I rode my mountain bike for 4 miles today, and it does seem a waste of my time to log that activty for a pathetic $0.12. I'll be more motivated to log my time consuming activities. But, even if I'm disciplined enough (I doubt I will be) to log every single activity I do every day, I know that by the end of the day, or even the month, the total amount will still be pretty small. But I've been receiving their newsletter every since I signed up. I wish they had some accounting as to how much each organization (cause) has received funding. At the beginning of the their last newsletter, they did state, "we’ve raised over $97,000 for our Causes!" If it's true, I guess that's the cumulative effect. At this point, I'll just give them the benefit of the doubt, believe that it's a noble thing to do, and be happy to be a tiny part of it. I do have some questions for them just like you do, Alison. The information disclosure on their website has been limited or vague. But again, they are not a non-profit organization, so I can't hold it against them. On the other hand, I don't think they are hiding from anyone either. A couple of their founders have been very active in the Low Key Hillclimb series. So, maybe someday when I go, I'll summon enough courage to ask them the questions face-to-face. Until then, I'm open to any genuine information anyone is able to share with us. I see this as a healthy discussion. If any reader who stumbles upon this post and has some thoughts to share, please leave a comment. Call me cynical, but the Plus 3 network strikes me as too much of a waste of time. I'm happy to just plain donate the small amount of money they raise instead of bothering with their silly web site. How do you know if they really make the donation? Do you ever get confirmation from the group you elect? Hi Alison, thanks so much for raising a different voice. I'm sorry I've been busy and it took me a couple of days to respond. And my response is so long that I incorporated it into my post above in the "Updates" section. Yep, there are unanswered questions I'm still searching the answers for. I know the Plus 3 folks fairly well and I can attest that it is all honest. They are a great group and really are trying to make a difference, not just make a profit. I've personally found it a good motivation to get out and do some non-core sports (eg I hardly ever walked anywhere but now look for any opportunity to walk places where I might have driven). Also, you can click on a sponsor and go to their page to see how much has been donated. The other great feature is the leaderboard. Especially towards the end of the month, it incents me to ride longer and more. And the challenges are yet another incentive to get out – I've received a bunch of free stuff from the challenge sponsors. I think Plus 3 is going to become the new motionbased.com one day – the place you go to find a good ride route. The website is very good (silly?) and they are constantly improving it (I rode with the developer frequently until he moved to AZ). Congrats on joining Mei! Looking forward to following your rides! Hi Patrick, thanks for sharing your knowledge. I did find that it easy as breeze to upload multiple activities from my GPS to this site. I like it. There are some features that are not overlapped by Plus 3 and Mtbguru (I don't use motionbased anymore). I'm still using both these days. Nice job on staying active and actively logging. Hope to see you high on the leaderboard again soon!